Oh my goodness, where has the time gone? It seems like only yesterday I was sharing my engagement with all of you. It's hard to believe that it was one year ago today that I said "I do" to my high school sweetheart and the love of my life. It truly does feel like yesterday. As Justin and I celebrate our anniversary ocean-side, we've each been rehashing wedding memories. Below are twelve of my favorite moments from our special day... twelve months ago. 1st Favorite Moment... Justin's super sweet and creative twist on the wedding day card. Since he's a screenwriter he wrote a script titled "The Moment When" detailing the emotions that were going to be running through his mind while I was walking down the aisle. The second page simply read, "To be continued...", followed by a couple dozen blank pages. 2nd Favorite Moment... When I stepped into my wedding dress. Even though I had tried it on multiple times during fittings, having my girlfriends, sister, and mom all by my side made the moment all the more special. 3rd Favorite Moment... Being silly with the girls during pictures. I'm pretty sure I'm laughing in 90% of my wedding photos. 4th Favorite Moment... The moment I spotted Justin at the end of the aisle. 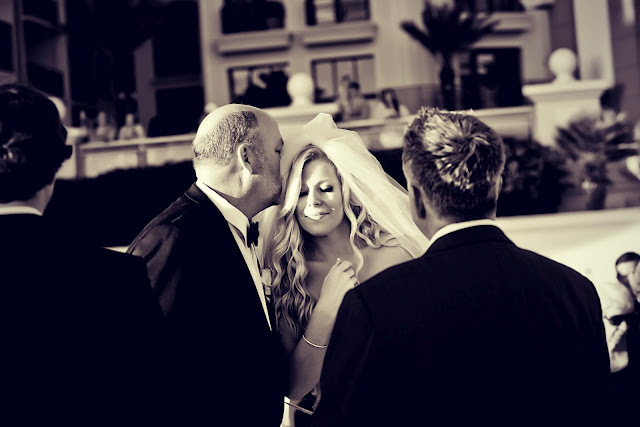 5th Favorite Moment... Having my father walk me down the aisle. We both cried the whole way and this picture is one of my favorites. 6th Favorite Moment... The bridal parties hilarious impromptu intros to the reception. The pictures don't do them justice. 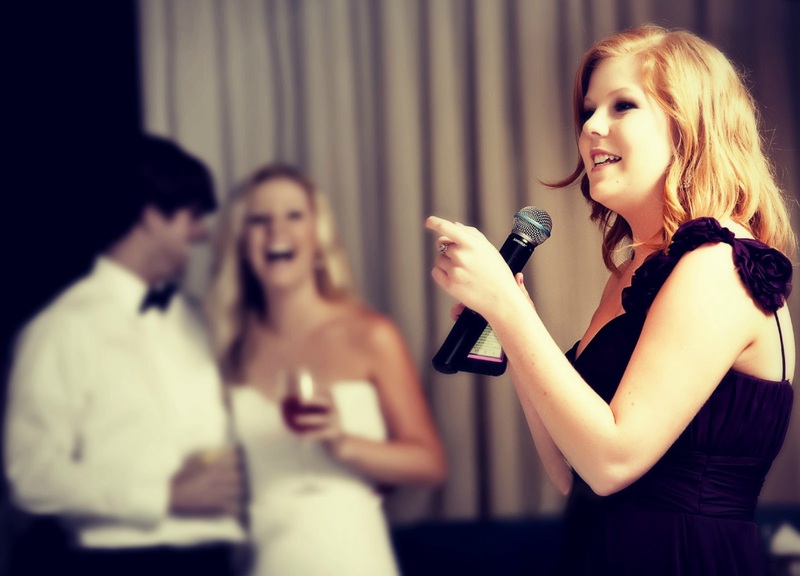 7th Favorite Moment... My sisters hilarious and heartfelt toast. 8th Favorite Moment... My little brother tripping over my wedding dress. We recouped like champs. 9th Favorite Moment... Justin surprised his mom with a dance to Jason Castro's "Somewhere Over The Rainbow" in memory of his grandmother. Everyone was in tears. 10th Favorite Moment... Seeing the wedding cake that Justin and I designed for the first time. 12th Favorite Moment... 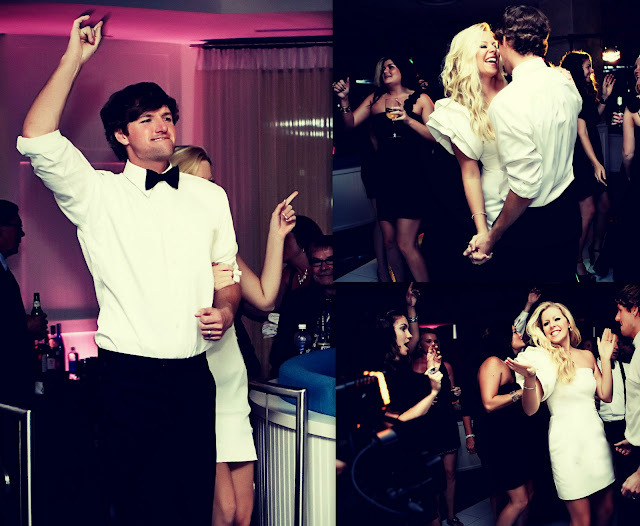 Dancing the night away. We re-entered to Bruno Mars' Runaway Baby, which was the perfect song to get the guests out of their seats. To see all of the pictures from our wedding and wedding week, be sure to click here. Ah and I'm crying again reliving it all and I wasn't even there! Happy Anniversary you two. There aren't two people on this earth who are better matched. Happy Day !!! You look fantastic in those pics! Don't miss todaymy last NEW IN......an Awesome CLUTCH. I'm pretty sure you will love it! Happy Anniversary Anna & Justin! We love you both and can't believe it has already been 1 year ago today that we got to celebrate your special day. It was an amazing wedding and the weekend was perfect. HAPPY ANNIVERSARY! Love, Sandra & Scott. Happy Anniversary Anna! All of these moments are too perfect! You had a wedding that girls dream about! I hope that one day mine will be as amazing as yours was! beautiful pictures and cake look amazing! Where has the time gone?! I've been following you for quite a while and remember your posts about your wedding preparations and now it's a year since the big day! I love all your wedding pictures and wish you an amazing anniversary and happy life together Anna. Such a dreamy and lovely photos! Congrats on the anniversary! These are such gorgeous photos and I love the cute candid ones and how you're smiling and laughing the whole time. It must be amazing to see these all again and relive your moment that was just a year ago. Congrats again on your first anniversary! Gorgeous!! You look incredibly happy!! I love it! I saw every single post and i love it!!! Beautiful pictures. U look so happy and amazing at your Wedding. Anna! 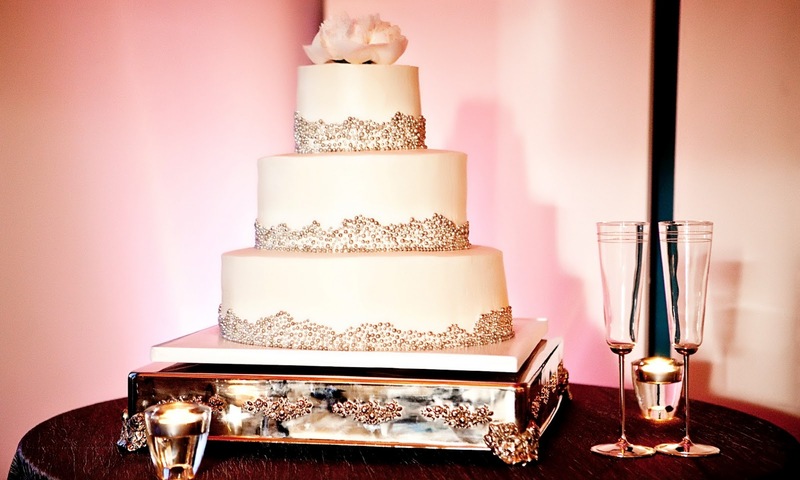 I will be getting married in June 2014 and I'm going to decorate my wedding cake just like yours. Thank you so much for the inspiration! I also made a tab on my wedding planning on my blog. Thanks you so much for all of the wonderful ideas! So amazing Anna! Congrats on your one year anniversary! You 2 make such a beautiful couple! You looked stunning on your wedding day, and the pictures seem to have captured your wedding day perfectly! Wish you and your hubby a lifetime of happiness and health! Congratulations Anna, so happy for you and your husband!! Your wedding was so gorgeous. Wow. You are such a stunning beauty! Anna you looked beautiful at your wedding, such a gorgeous bride! so beautiful! thank you for sharing these sweet moments. What a sweet couple! Wishing you lots of love, happiness and laughter in the years to come! So fun!!! I love all the pictures! You looked beautiful! Beautiful wedding recap! Happy Anniversary! The photos are all stunning! You looked so beautiful, looks like a perfect day. Congratulations, this is just wonderful! Happy anniversary, gorgeous girl!! I love all of your wedding pictures! :) Such a sweet post, too. Since I am a new follower they got me to see the previous posts about the wedding. those sparklers remind me of harry potter. kind of love it!! your wedding looks so so beautiful! happy anniversary! your wedding was so beautiful! i wish my would be like yours. It looks like you had an AMAZING day! Such beautiful photos and moments! Happy Anniversary! Congrats on your one year!! You made an absolutely beautiful bride. These pictures are amazing and so full of emotion. I love this idea of counting down your favorite moments! Congratulations on your anniversary! All of your pictures are stunning, I love your dress! Thank for posting this favorite wedding moments! :) Maybe we could follow each other on Bloglovin and/or GFC? Happy Anniversary!!! Your wedding was absolutely Gorgeous. WOW, absolutely aweseome Wedding Pictures! Congrats! happy ammiversary! those are beautiful photos! Happy Anniversary, wishing you both many more years of happiness. Oh see cute! As someone who has recently become engaged I am loving reading through your wedding pics! Congratulations to your anniversary Anna. Youre wedding was amazing and I love looking on your amazing wedding photos. Hopefully I have such an amazing wedding someday. Lovely wedding :) Thanks for sharing these photos! Congrats!!!! The pictures are gorgeous. YOu were a stunning bride. Amazing moments, you were so gorgeous and I think you are a great couple!!! Awwww Happy Anniversary, you just looked so gorgeous and I love that you are smiling in almost all of your photos! You definitely had a blast! OMG!! Thanks for stopping by my blog and leaving a lovely note. I love your blog and you're one of the few bloggers that inspire me. Anna, Thanks for sharing your beautiful day with us. You are a beautiful bride. I'm sure you took your husband breathe away as well as your guests. Thanks for sharing all these great ideas. These are such great pictures! Happy anniversary :). I love that you are laughing in a lot of your pictures; shows you had a great time! 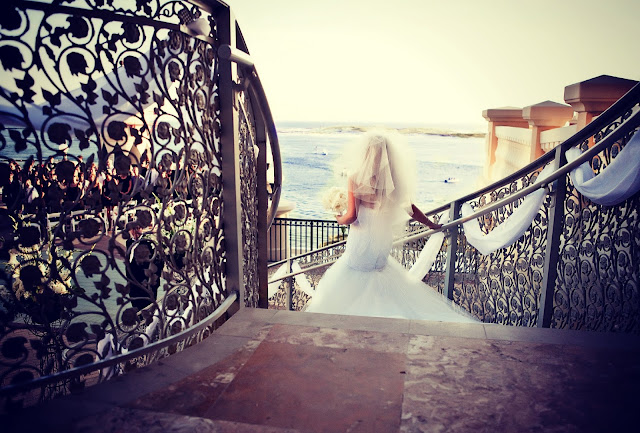 Your wedding dress is absolutely beautiful! I cannot wait for my special day! Amazing photos and memories~ Happy 1st Anniversary, with many more to come! You and I got married around the same time (mine 1st anniversary is coming up at the end of the month). Anna you looked amazing , wow your wedding looked beyond beautiful! Thank you for sharing such a personal moment . Beautiful shots! Looks like such a great wedding! Happy Anniversary! Beautiful photos! Congrats on a great year! omg anna! your photos are beautiful! what an amazing memory and happy anniv! time flies!! Such beautiful pictures!!! Love all the happiness in the pictures!! and happy anniversary! Wow Anna!! I already knew your story because I remember that I discovered your blog with your wedding... your posts were like so addictive! I have enjoyed a lot this new post and I wish you all the happiness in the World! You were a beautiful bride!! Happy anniversary, your pics are stunning! Awww what a perfect night!! Congrats and Happy Anniversary!! I just saw this post, and you look beautiful! Thanks for sharing this important moments of your life with all of us! You literally all look like you're having a blast! Fantastic photos! These are perfect poses clicked at perfect time. The most important thing is the simplicity, elegance, beauty and charm carried by the bride. This is really lovely and amazing all wedding pictures. Both of you looking gorgeous and fabulous.